One of my favorite traditions growing up was the advent calendar. My parents would get me a simple cardboard version each year with a piece of chocolate inside. I would get to open it at breakfast each day. Chocolate for breakfast! I bought one for my daughter this year, but at 2 years old, I am doubtful she will understand the concept, but we shall see. If you have aspirations to make gifts for your loved ones this year, you better get started! Hands down, my favorite craft store in town is Collage! There locations on Division and in Sellwood, but the original Alberta location is the best (IMO). 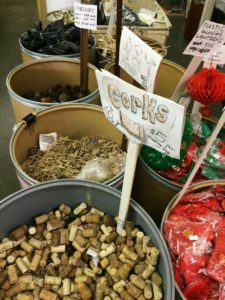 They carry everything from traditional art supplies, to stamps, washi tape, books, coloring books, and everything you will ever need for a fairy garden. Plus the store is filled with project ideas to get you inspired. Break the crafting mold at SCRAP! No easy templates here, this place is all about imagination. 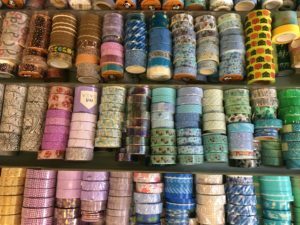 Need fabric, beads, buttons, stationary, or wrapping paper? Or just that perfect SOMETHING to finish a project? SCRAP has it all… usually. Finding something you need can be tricky as their supplies change frequently, but treasures abound in every corner. Arrive with an open mind and plenty of time to dig around. Do your love ones have a really cool Thunder egg? How about a crystal? Well get them one at Ed’s House of Gems! 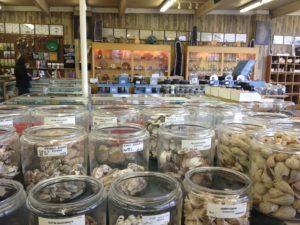 They have amazing crystals, fossils, thunder eggs, gems and shells or if you have a budding rockhound in your family, they have a great selection of polishing equipment. And the cherry on top, everything you need to pan for gold. 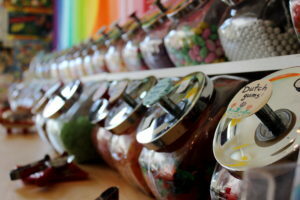 Scoop candies from around the world at this charming little store on NE Alberta. Unusual flavors and fun shapes abound. Pick up stocking stuffers, unique treats for your holiday party, or just a little something to fuel your shopping spree. And if you love black licorice, there is a big selection just for you. They also specialize in vegan, gluten, dairy, corn and dye free candies. 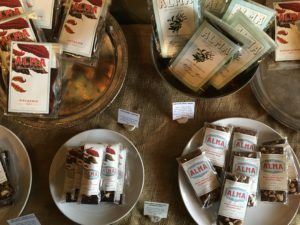 Candy Babel is owned and operated by one woman, so you can feel great about supporting this fantastic local business. This store only carries a few things: salts, chocolate, flowers, wine & cocktail bitters. But everything they do carry is the highest of quality. 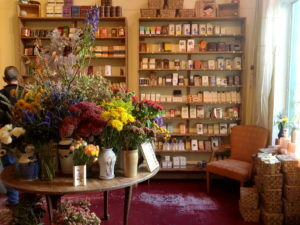 Amazing bars of chocolate, gorgeous flowers, a huge selection of cocktail bitters and most importantly a towering array of salts. The salts are imported from around the world and you can taste them all. You’ll find the perfect gift for a chef or cocktail lover on your list. If you need a hostess present, I can’t think of a better store. They even have gift packs if you need something fast. Mr. Green Beans specializes in one thing: coffee. 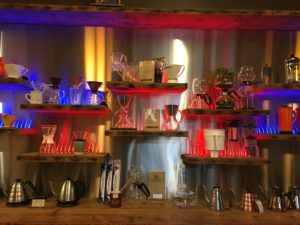 Specifically home coffee roasting While I don’t necessarily suggest pushing a new roasting hobby on your loved ones, I do suggest stopping in for some high-end brewing equipment. 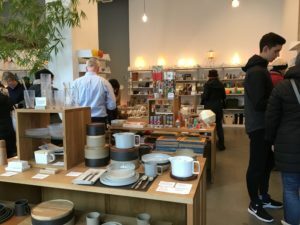 They sell kettles, pour over devices, presses and full size pots and all would make a great gift for the coffee lover in your life. And if you want to try roasting coffee, they’ll give you instructions on how to do it at home, without buying all the expensive equipment. Twice a year this monster craft show takes over the convention center. 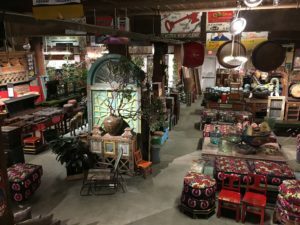 Jewelry, vintage decorations, bike accessories, paintings, calendars, soaps, sweets, furniture, pottery, beauty products, clothes, toys, and all kinds of crazy stuff you can’t even imagine are on sale here. It can be crowded, hot and very tiring but for me the biggest problem is sticking to my list, rather than buying for myself. This one is for the gamer, puzzler or kids on your list. Clou d Cap Games in Sellwood is one of the best game stores in town IMO. 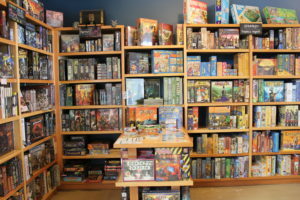 (Although Guardian Games is pretty rad too with a BAR inside and room play) The store is fairly small but it is wonderfully curated with a wide selection of everything from resource management to strategy to party games. But the best part of this store is the service. No matter what game I ask about, one of the employees has played it and can talk about it’s merits/challenges. Fancy board games like this aren’t cheap, so it’s nice have a first hand knowledge about your purchase. Need a gifts for the person who has everything? You are sure to find a treasure, they never would have imagined at Paxton Gate. 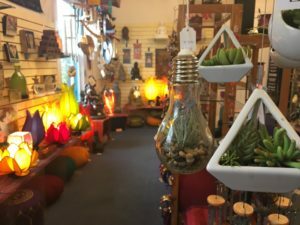 Packed full of taxidermy, oddities, natural wonders, carnivorous plants and specimen jars, books and fun science kits for kids, this store does not disappoint. If you need a reticulated skeleton, they have it. If you need a Venus Fly Trap, this is the spot. And if you have always wanted to learn how to pin bugs, they have classes! Even if you don’t know anyone who needs that kind of stuff, stop in, it’s a great place to browse! We only made it a few steps inside Thinker Toys before the entire family was playing! 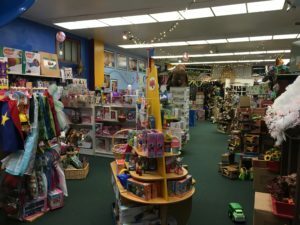 This store is packed with toys for every age. From toys for babies to Tonka Trucks, Playmobile, blocks and building kits for the older kids, there is something for everyone. Be sure to give yourself plenty of time to hang out. I had to drag my kiddo crying out of their playhouse when the store closed! Thinker Toys is everything you hope from a toy store: high quality toys, a great selection, and lots of fun. And t’s a great excuse to spend a little time exploring charming Multnomah Village. In honor of my baby turning two today (Not really a baby anymore. Le sigh…) I’m adding Posh Baby to advent calendar. In my life right now, it seems like everyone is having babies. So now there are little tots to buy for and lots of expectant/new parents to support and this is a great place to buy really nice gifts. Don’t expect it to be cheap, they have nice stuff and it can be spendy, but for a special gift you know they won’t buy for themselves, there is a ton to chose from. For smaller gifts, they have beautiful clothes, high quality toys, feeding and bathing supplies. Or if you really want to splurge they have beautiful furniture and the best of the best in carries, strollers and swings. If you are looking for a little something special for a lady, or a lady with a baby in your life, The Yo Store might be just what you are looking for. 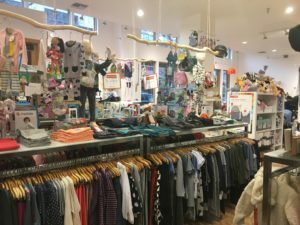 They carry unique vintage clothing along with gifts, housewares and even some cool stuff for babies. The store is unassuming right off of Lovejoy but it is beautiful inside and a lot of fun to browse around. I had my eye on some jewelry, a fun light box and the pillows. In my opinion, Cargo is one of the best stores in Portland. Not only do they have truly unique products and a fantastic selection of home decor, but they make it fun to shop. Their huge warehouse in the Southeast Portland industrial area is beautiful and cavernous with lots of nooks and crannies to explore. There is an entire room dedicated to locks and keys! You never know what you are going to find here. While some of their imported furniture is very expensive, they great stuff at all price points. I recently bought some new poster art for my living room for just $4.50! Don’t miss their season decorations either, their Christmas and Day of the Dead displays are incredible. Flutter is another treasure trove to consider for your holiday shopping. 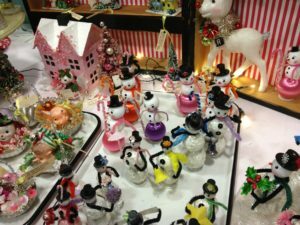 A bit more fun and frilly than some of the other stores, it’s great for trinkets, stocking stuffers or little gifts for friends. 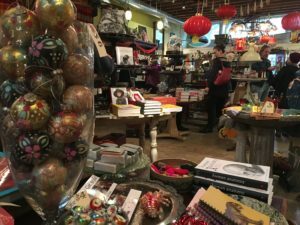 They carry funky books, house goods, vintage clothing, accessories, christmas ornaments, candy, jewelry, toys, masks and all kinds of bath and body products. There are all kinds of great gifts in here, but my favorite part of shopping her is the ambience the store owners have created. It’s dark, moody and and full of surprises. So next time you are on Mississippi Ave, be sure to duck in and check this place out. It’s unassuming from the outside so don’t miss it. I have been shopping at New Renaissance since I was in high school in the 90’s. We would drive into the city for coffee at Vivace, Coffeetime or Anna Bananas then hang out looking at the trippy stuff in New Renaissance. They describe themselves as a “conscious living bookstore” I would probably describe it as “new age”. It’s packed full of books on religion, philosophy, yoga, meditation, feng shui and so much more. There is an ENTIRE ROOM devoted to smudging. You can buy crystals, rocks, and incense. But they also have beautiful things for your home like wind chimes, fountains and salt lamps. The store is very zen and very Portland. Old-school Portland. So if you are out shopping on 23rd, be sure to stop in and support this great local book store. Enamel pins and patches are in right now and Darling Distraction is the place to get them! This place is adorable tucked away on a side street just off of NE Alberta. 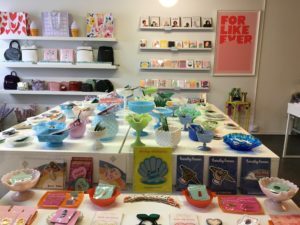 The store is full of cute knick-knacks, stationary, party decor and tons of accessories. There is lots of glitter, neon and pastels and just cute stuff. If you need a little something to tuck into a Christmas Card or just some sassy accessories, stop in. They also sell online, if you can’t make it to Alberta. If you are still stumped about someone on your list, it’s worth a try to stop in at Canoe. This show is all about high quality, modern accessories for your home, work and life. 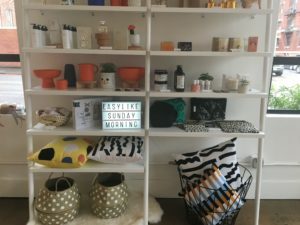 They carry everything from beautiful dishes, knives and vases for your home, to cool backpacks for your commute and even lots of fin kids toys. This store is warm, inviting and full of beautiful products. Don’t miss it. If you are looking for locally made gifts, this is the place. 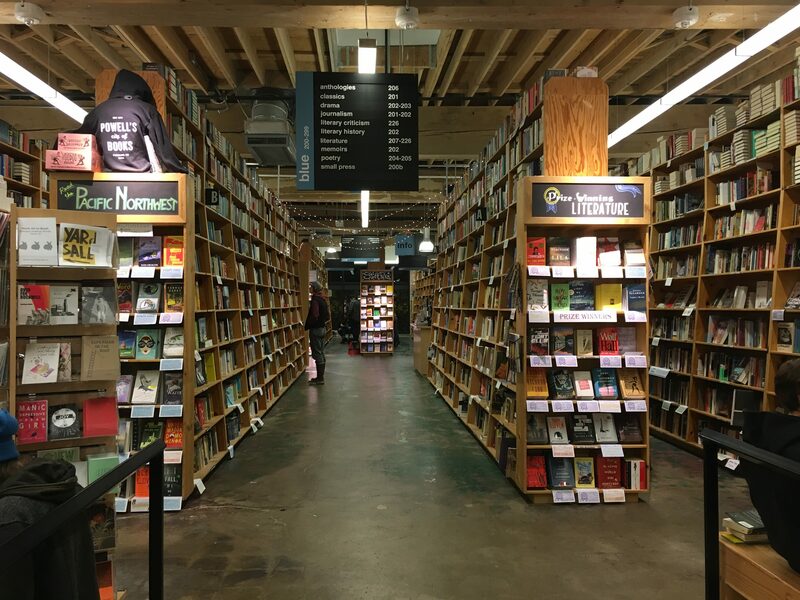 This store, across the street from Powell’s is packed full of local gifts of every type. 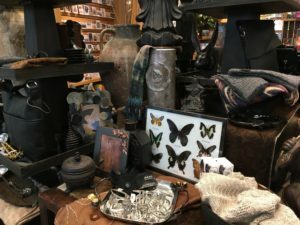 They have everything from food, to clothing, art, furniture and leather goods. 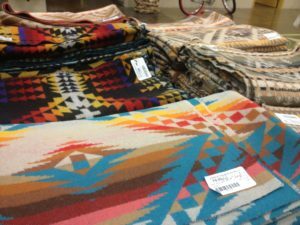 I have my eye on a cool Chester Wallace backpack. They also carry North drink ware which feature 3D models of local mountains in the bottom of the glass. Really cool. Plants are a tough gift. For some people they are a welcome new family member. For others, a new plant means burden and guilt. But at Pistils you might be able to find something for everyone. They have gorgeous, luscious house plants that need water and care. Air plants for the occasional waterer and terrariums for the real abusers. (Although I think a terrarium is a great gift for just about anyone.) 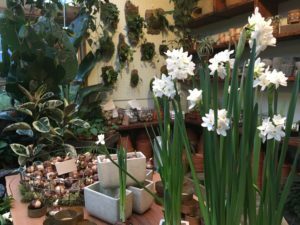 And if you aren’t sure a plant is the right choice, they also have art, pottery and other garden supplies that might work for the people left on your list. Plus the store is beautiful, duck in even if it’s just to warm up. It’s easy to overlook, but the gift shop at the Portland Art Museum is not to be missed. It is just packed with all kinds of wonderful gifts. Of course, there is your traditional Art Museum fare, like books about artists and painting, but that is just the beginning. 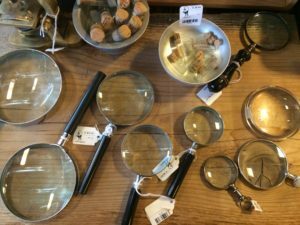 Gardening supplies, photography accessories, dramatic magnifying glasses, scarves… the list goes on. There is also a number of local gifts and a fantastic section for kids. I feel like most of my gift suggestions are focused on ladies. So here’s an idea for the men on your list: Boys Fort. This charming shop (right on the Max line in downtown) is full of great stuff. 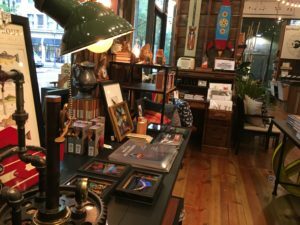 T-Shirts, shaving supplies, leather goods and all kinds of masculine things for the home, from kitchen to barware to art. Plus it’s displayed so creatively using trucks and old tents making it a really fun place to look around. 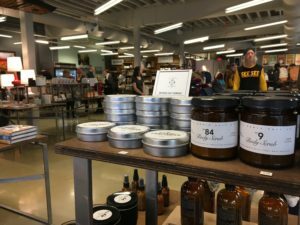 This store definitely isn’t for all men, but if you have one on your list who enjoys fine things for their home check it out. It’s getting down to the WIRE. When in doubt, buy chocolate. Bonus points if you shop at one of Portland’s fantastic local makers like Alma. They have original flavors like thai and matcha and make cool religious icons out of chocolate. I love their bars for stocking stuffers but pretty much everyone in line today had a jar of caramel sauce in their hand. If you can’t make it here, Cacao, Pitch Dark, and Woodblock are all great options. If you’ve really procrastinated, or just have no idea what to buy someone, try New Seasons Market. 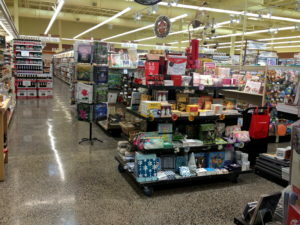 It may be a grocery store, but they have a pretty nice gift and housewares section in all their stores as well. Beautiful kitchen stuff, books, stationary, beauty products, candles, Oregon and Portland themed gifts, and even some fun kids toys. And if you still can’t find anything: Buy booze.